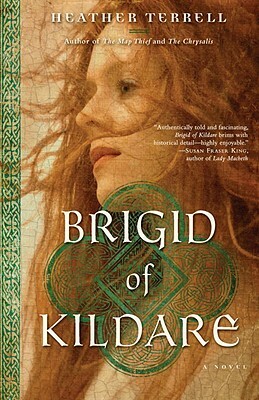 Rich in historical detail, Heather Terrell’s mesmerizing novel Brigid of Kildare is the story of the revolutionary Saint Brigid and the discovery of the oldest illuminated manuscript in the annals of the Church, a manuscript that contains an astonishing secret history. Fifth-century Ireland: Brigid is Ireland’s first and only female priest and bishop. Followers flock to her Kildare abbey and scriptorium. Hearing accounts of Brigid’s power, the Church deems her a threat and sends Decius, a Roman priest and scribe, on a secret mission to collect proof of Brigid’s heresy. As Decius records the unorthodox practices of Brigid and her abbey, he becomes intrigued by her. When Brigid assigns Decius a holy task—to create the most important and sacred manuscript ever made—he finds himself at odds with his original mission and faces the most difficult decision of his life. Modern day: Alexandra Patterson, an appraiser of medieval relics, has been summoned to Kildare to examine a reliquary box believed to belong to Saint Brigid. Hidden within the sacred box is the most beautiful illuminated manuscript Alex has ever seen. But even more extraordinary is the contents of the manuscript’s vellum pages, which may have dire repercussions for the Catholic Church and could very well rewrite the origins of Christianity. Heather Terrell is also the author of The Chrysalis and The Book of Kildare. A lawyer with more than ten years’ experience as a litigator at two of the country’s premier law firms and for Fortune 500 companies, Terrell is a graduate of Boston College and of the Boston University School of Law. She lives in Pittsburgh with her family.